Hello and welcome to the 45th installment of the SWD. Turkey announced that the Euphrates Shield operation has successfully ended, even though it was announced at the start that the operation will be against both SDF and IS, groups that Turkey sees as a threat to its national security, majority of the ES operation focused on IS. Before anyone reaches the conclusion that Turkey is just going to “spare” SDF and keep TFSA as garrison force in Northern Aleppo or send them to Idlib, a possibility exists that Turkey launches a new operation in Syria this time specifically directed against SDF. This hypothetical operation’s minimum goal would be capturing Manbij with its surroundings and forcing SDF to go east of Euphrates river because that is the “red line” for Turkey that they mentioned a couple of times now. Maximum goal of this hypothetical operation would be removing SDF from Turkish border and maybe even dismantling it, however Turkey might be discouraged from committing any of these moves since both US and Russia have troops in SDF-held territory and are backing it politically and militarily. It seems that SAA has finally entered Deir Hafer, new video by reporter Shady Hulwe from the center of Deir Hafer can be found here. SAA launched an attack north of Qomhane presumably under the cover of night capturing several farms and a railway station, these advances suggest that SAA might be trying to surround Khattab area instead of just attacking it. Later in the day Jaysh al-Nasr issued a statement claiming full control over Tell Sheeyha southwest of Qomhane, however just a couple of hours later SAA reportedly recaptured the hill and to confirm that the hill is back under SAA‘s control Free Idlib Army released a video of them targeting a BMP on Tell Sheeyha with an ATGM. Besides capturing aforementioned Tell Sheeyha, SAA and allies captured Tell al-Samam north of Qomhane giving them fire control over Khirbat al-Hajamah, east of Khattab. 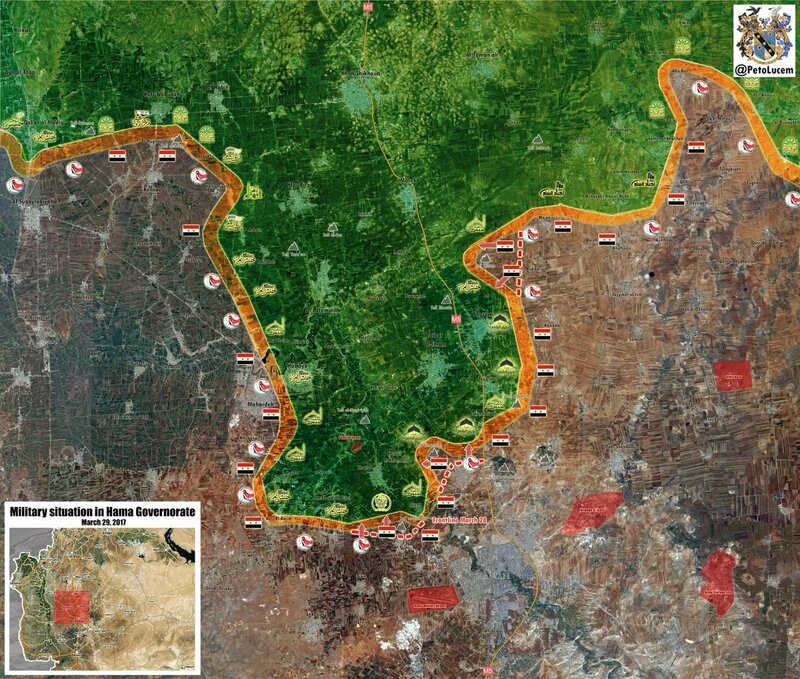 With Tell al-Samam now under SAA control it makes it harder for rebels to attack Qomhane now. North of the captured Tell al-Samam a checkpoint called “point 50” was also captured by SAA, however, it was later recaptured by rebels. The last SAA capture of the day happened northeast of Souran and it was once again a hill, Tell Bizam. On the Kernaz axis Ahrar al-Sham and Faylaq al-Sham-led offensive reportedly captured Buraydij, west of Kernaz. Buraydij and Mughayr were shelled earlier in the day, an attack on Mughayr, east of Kernaz is also expected to take place. In a new statement Jaysh al-Izza claimed to have killed 30 pro-government fighters in an ambush on Majdal front. Few days ago there were reports that SAA was attacking Majdal and now we know the fate of the attack. Even though Jaysh al-Izza released a video showing a sizeable number of NDF or SAA killed fighters, number of casualties still seems a bit inflated for propaganda purposes. In the predominately Alawite neighborhood of Al-Zahra in Homs city an IED exploded targeting civilians. Number of casualties is estimated at five dead and six wounded. New report emerged suggesting that SAA‘s 5th Corps backed by allied militias is preparing an offensive from Palmyra towards Al-Sukhnah with a long-term goal of breaking the siege of Deir al-Zour. A month ago it was reported that there are currently no plans to advance east of Palmyra in direction of Deir al-Zour. Either the stance changed and new offensive was planned or previous report was false and SAA was just building a bigger buffer zone around Palmyra before departing to the east. 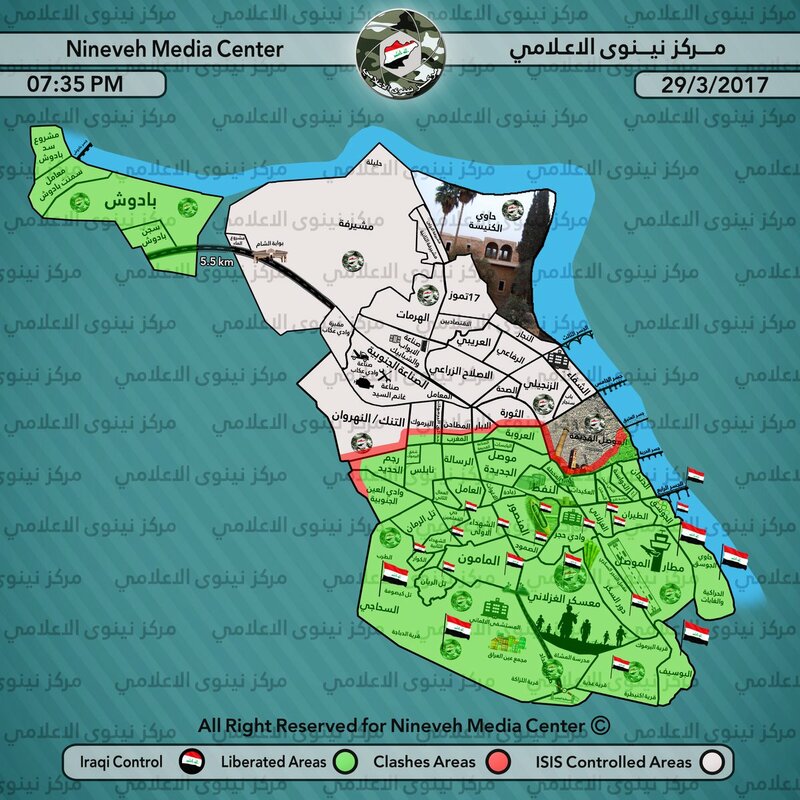 Iraqi Army opened another front in “old Mosul” district, capture of Al-Aruba district allowed Iraqi Army to start attacking the district from the western side. West of “old Mosul” Qathib al-Ban neighborhood and the main stadium in western Mosul were liberated. Iraq provided SyAAF with information about IS positions in Abu Kamal and Deir al-Zour areas which were then targeted. SyAAF targeted 39 IS position which were used by IS to produce weapons and IEDs. CJTF-OIR reported that today one of the US service members has died reportedly of natural causes in Northern Syria, further information about incident will be released once more is known. On the 28th of March 2017 CJTF-OIR has conducted 20 strikes in Syria. CJTF-OIR‘s main focus in Syria at the moment is Tabqa-Raqqa region where they did 14 strikes supporting SDF‘s operation against IS destroying 23 IS barges, three wellheads, two vehicles, two front-end loaders and a truck and trailer. Other areas where six strikes occurred are Abu Kamal and Shadaddi destroying two IS wellheads and three tactical vehicles, three vehicles, two bulldozers, two front-end loaders, a vehicle-borne bomb & a tank, respectively. Full report on CJTF-OIR strikes conducted in both Syria & Iraq can be found here.